Last year, California experienced its deadliest forest fire in history — that was, at least until this year, when the Camp Fire destroyed an entire city and left 88 people dead and more than 200 missing. 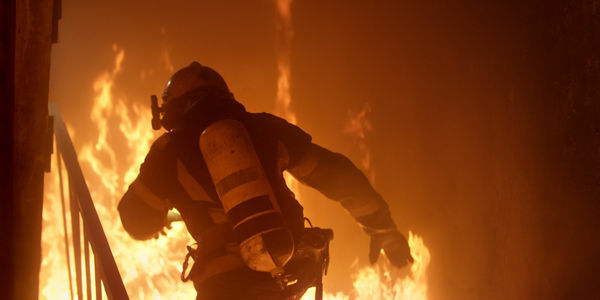 Every single day the flames burned, brave men and women risked their lives as firefighters trying to put out the blaze and save lives and property. But while some of them have years of training, and compensation that matches the risk they face, others make pennies on the dollar for doing the exact same task. Since 1946, more than any other state, California has relied on a faceless group of prisoners to fight wildfires. Men, women and youth prisoners can volunteer for the program. Those who have accepted get training, a sense of purpose and a minimum hourly wage. They can even get shortened sentences. But once they are released from prison, all of that training and experience on the front lines of California's deadliest fires, will not actually help them to get a high paying job as a real California firefighter. Most counties in California require all firefighters to get Emergency Medical Technician (EMT) training but the credential can be hard to get or even impossible for ex-convicts who can be denied a license for having a criminal record. The fact that this twisted policy continues without challenge is exactly what is wrong with the criminal justice system. Ideally, we want our convicts to do their time and then quickly join the workforce to become contributing members of society. But in California, when you have a functioning program that has helped to train thousands of people with a skill that is in high demand, the state allows these ex-convicts' potential to go to waste. This is not right and it doesn't align with the spirit of the true purpose of criminal justice — to give second chances after time has been served. There must be a law banning counties from denying EMT licenses to ex-convict firefighters simply because of their criminal history. Please sign the petition and ask the California Assembly to pass a law guaranteeing the right of former prisoners to have a fair shake at becoming a firefighter without discrimination.